The pre-release function of Baahubali: The Conclusion has happened at Ramoji Film City on Sunday, 26th of March in Hyderabad. It was the conclusion event for five long years of journey into the Mahismathi kingdom and it was concluded with a grand audio launch. 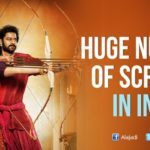 Attendees to this event include entire cast and crew of Baahubali, Karan Johar, actor Nani, Krishnam Raju, Nimmagadda Prasad and others. 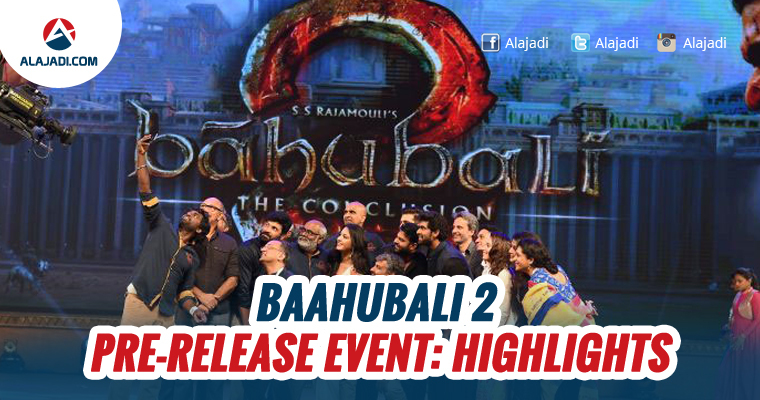 In 3-hours of the prestigious event, audience witnessed several key highlights and it’s one of the biggest night for Baahubali fans. Nowadays, Live streaming of the movie events on YouTube become quite common in Tollywood. Now, the makers of Baahubali 2 have decided to take this grand pre-release event to the next level by live streaming it in 360°. For 360° live streaming, Makers have teamed up with AMD Radeon. Director of the Film, SS Rajamouli confirmed this news on his official Facebook page. Bollywood’s filmmaker Karan Johar attended the function as a chief guest. All the film’s cast and crew graced the occasion. Suma Kanakala has done anchoring. Vijayendra Prasad hoped producers Shobhu and Prasad Devineni would earn the fame like Nagireddy-Chakrapani duo. DOP Senthil Kumar lauded Rajamouli as James Cameron of Hollywood. He further went overboard stating that Cameron is the Rajamouli of Tollywood. Furthermore, Prabhas was praised as the biggest star of India. Ramyakrishna felt entire team maintained the same energy levels until the movie’s completion. Satyaraj said everyone is calling him as Kattappa. Tamannah felt working for Baahubali as once in a lifetime opportunity. Krishnam Raju compared Rajamouli as Steven Spielberg. He recollected his recent experience when PM Modi, who called himself as Kattappa and how he was saving royal chair. Krishnam Raju, however, acclaimed Modi as ‘Baahubali’ but not ‘Kattappa’. K Raghavendra Rao wished Rajamouli to get more successes with the support of Keeravani and all of his family members. Karan Johan said it’s privilege for standing on the prestigious dais. He compared ‘Baahubali’ with Bollywood’s all time classic ‘Mughal-E-Azam’. Further he said he was humbled to be part of the film’s team distributing it to Bollywood. Keeravani thrilled audiences showing an audio song on the screen that praised Rajamouli. Rajamouli went emotional watching the song. “Prabhas has no pride. He has good heart and had God’s grace,” said Keeravani. Rana opined Prabhas was the best co-star for him. Rajamouli thanked each and every technician from various crafts who worked hard for the film. Almost everyone were praise for three women behind magnum opus Baahubali – Sri Valli, Rama Rajamouli and Prashanti. MM Keeravani’s tribute to his brother and filmmaker had left Rajamouli in tears and he turned emotional for next few minutes. Soon after Rajamouli got off the stage, director K Raghavendra Rao and producer Shobu accompanied him to his seat and the director emotionally hugged his daughter for next few seconds. It was mind blowing welcome with great visuals to Prabhas and Rana before they appear on stage. Anushka as usually, looked flabby while Tamannah looked ravishing. Prabhas was handsome but needs to shed some weight. Krishnam Raju’s flattery on Prabhas and Rajamouli appeared to have crossed limits. K Raghavendra Rao appeared to have thrown a satire on Rajamouli for Padma Sri award. Rajamouli shedding tears for a song composed by Keeravani on him was an awesome moment. Audience maintained silence without much noise except when Prabhas appeared on the stage and a couple moments where Prabhas’ name was mentioned by the speakers.